Celtic knots are an Irish symbol you’ll find everywhere from designer jewellery to tattoos worn by rock n’ rollers to, of course, the original Book of Kells back in old Dublin. It’s not clear that Celtic knot drawings were ever meant to symbolize anything, but lots of modern people think they contain spiritual concepts. The knots are incredibly popular with followers of new age religions, magic societies and all sorts of other groups who want to draw an association with the oldest traditions of Ireland. They also look pretty cool in T shirts. Whether these Irish Celtic symbols were originally meant to represent anything or were just created to be pretty pictures isn’t clear. The Celts, who dominated the culture of pre-Christian Ireland, simply didn’t place much importance on creating records to help future generations understand their symbols. Some historians thing the Celts drew them because they were prohibited from drawing any other pictures. One of the more widely accept theories to explain Celtic knot meanings says that Celtic religion, like Islam, may have prohibited realistic depictions of living creatures. This rule, which gave rise to extraordinary Arabic calligraphy may have given birth to the complex Irish knots. Animal Interlace: Sometimes representing men and animals intertwined, believed to represent relationships of men to women, hunters to their prey or others. Circular Knots: Possibly symbols of cycles of life or eternity, but also seen as a sign of unity. 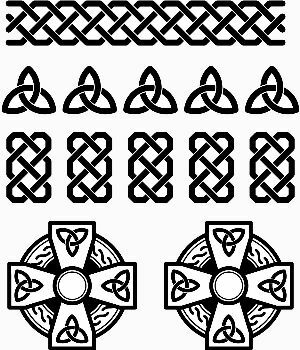 The “endless" quality of Celtic knots seems to make lots of people assume they symbolize time without end, possibly because the look a bit like the familiar horizontal 8 symbol we use the represent eternity. Squares: Known as “shield knots," and said to offer protection from evil spirits. They were often placed on battle shields or near sick people. We’ll never know whether these meanings were really there for the Celts. A key reason the knots are associated with religion is that after the Christians came to power in Ireland, they adopted the knots to their own religious purposes (just as they adopted many Celtic holidays for the Christian calendar). Re-designed versions of the knots appear in Christian scriptures, where intertwined hearts are presented as a Celtic symbol for love. These are usually a good deal more complex than the old Celtic drawings and carvings. Other symbols woven into the knots by Christian calligraphers include crosses, harps, shamrocks and other popular images. But the knots may not actually come from Ireland. Many scholars believe they were simply brought into Ireland when Norsemen conquered the Celts. Designs that seem similar to the Irish knots have been found in old Italian and British manuscripts, and on pottery and architecture in other parts of Europe. The best historical explanation may be that from the sixth to the eighth centuries, a long series of wars took place between British, Irish, Pictish (Scottish) and Scandinavian tribes, which meant that both winning and loosing groups of warriors wound up living in each other’s countries for considerable periods. The influence of all these cultures on each other may be what really gave birth to a style now called Celtic Interlace (a more exotic theory is that Coptic monks from Egypt visited Ireland in the 7th century and brought the design styles with them). The knots were quite prevalent in the Celtic world, appearing on pottery, buildings and on the familiar Celtic crosses that dot the island. Some of the most beautiful examples turn up on ceremonial jewelry found in archaeological sites in Ireland. Some say the knots are actually a code that makes up a symbolic language, and one intrepid fellow has put forth the idea that they are actually a form of music notation. Few serious historians support either idea. Whatever their origin, the knots have become favorites of all sorts of “new age" groups, who see them as Celtic love symbols, Celtic symbols of “Tree of Life" (a concept which had no meaning to the Celts) and a whole range of other things. Wiccans, the modern day pagans who actually follow a number of old Irish traditions, have adopted some very Celtic-looking knot designs as magic symbols. A deeply psychological view of the knots comes from Wikipedia, the popular online encyclopedia, which says “It might even be argued that, from a Jungian point of view of the collective unconscious, the meaning was always there but hidden during the act of creation and revealed in their contemplation." Phew! The most popular interpretation, put forth in countless websites and books, is that because the Celtic knots are almost always “endless" – complete loops without beginnings or end – they must represent some concept of eternity. Of course, if you want a good look at some very famous original celtic knots, pay a visit to the Book of Kells in Dublin, which was created in 800 AD.